Service & Repair Center Santa Rosa, CA. We are a family owned and operated independent Mercedes-Benz Service and repair center in Santa Rosa, CA and are proud to say it. Since 1977, we have been providing motorists outstanding Mercedes repair and maintenance to the Santa Rosa community. We also provide Mercedes-Benz service for the areas of Rohnert Park, Sebastopol, Petaluma, Sonoma and Healdsburg, CA. Specializing in Mercedes cars and trucks, our Mercedes-Benz technicians use the latest diagnostic tools and machines to accurately make repairs. We are praised for our honesty and workmanship by our loyal customers. With 20+ years experience working on Mercedes-Benz vehicles, Paul is considered by many as one of the most qualified Mercedes-Benz technicians in Santa Rosa, CA. His expert knowledge, professionalism, and honesty are some of the reasons why customers keep coming back to service and repair their vehicles. Paul provides excellent professional and personal service at a fair price on my Mercedes Benz. Taking the car to the shop can be stressful but Paul's style and follow through remove a good portion of the stress. Paul understands what it means to have loyal customers who are invaluable to the success of his business and he knows as long as he is providing excellent service they will be his best advocates. I recommend his shop to everyone I know who owns a Mercedes. I'm always satisfied with the work at C & K. I feel very fortunate to have found Paul and will always recommend him. The C&K license plate frame is on my car even though I've never advertised anything on my car before. I highly recommend Paul to everyone I know who drives a Mercedes. My only wish would be to have him here in Healdsburg. I purchased a Mercedes approximately 5 years ago and was referred to Paul at CK Auto Exclusive by two friends. What a great referral. My granddaughter is now taking her car to CK Auto as well. When you call you always hear a friendly voice and his service is quick, efficient and above all honest. 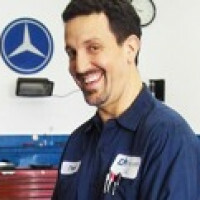 If you are looking for a great Mercedes mechanic, CK Auto Exclusive is it. I feel very fortunate to have found Paul at CK Auto Exclusive for Betty's Mercedes needs. She's getting on in years and Paul has taken such great care of her for at least 10 years. His honesty and friendly demeanor are invaluable and I trust him which I haven't been able to say about any other mechanic I had taken her to. I would highly recommend him because he is a rare find! Paul is AWESOME and he does excellent Mercedes work. Paul worked on our C320 and it hasn't run this great ever! All I can say is you would do well to bring your Benz to Paul at CK Auto Exclusive for its maintenance and repair work! I went in to this guy's shop, CK Auto Exclusive, for Mercedes repair and he is very good at what he does. I heard about him from some other folks in the area and found that they were RIGHT! He's good.